Malta Maritime Directory :: Sette Giugno Cruise To Pozzallo! Comment about: Sette Giugno Cruise To Pozzallo! Sette Giugno Cruise To Pozzallo! The 'Sail along the Pozzallo coast' is a pleasant experience to all during the Malta-Pozzallo Sette Giugno Cruise. The Sette Giugno Cruise to Pozzallo organized by the Malta Cruising Club (MCC) this year on its fourth edition is gathering momentum and is expected to see a bigger cruising fleet than the previous editions. Non-members of the MCC are welcome to join Club members on what is regarded as an enjoyable all-family event. The Pozzallo section of Lega Navale are once again extending their enthusiastic collaboration to the “4^ Veleggiata dei Cavalieri 2016”, as the Event, being held under the Patronage of the Commune of Pozzallo, is referred to on the finish side of the 93Km Cruise. The successful start procedure followed in the past editions is again being adopted whereby each boat leaves Malta at its cruising speed. This means that if a boat cruises at six and a half knots, it will leave a 6:30 am, a boat that cruises at 7 knots leaves at 7:00am and so forth. Such a procedure should have participating boats within sight of each other for most of the trip where all boats should arrive at Pozzallo between two and three in the afternoon or thereabouts. This year the Sette Giugno Cruise starts on Saturday 4th June where on the first evening at Pozzallo Mass will be held at the Clubhouse of the Lega Navale Sezione di Pozzallo on the marina where the MCC yachts will be berthed. Following Mass a Welcome Fish Night Dinner for all is planned. 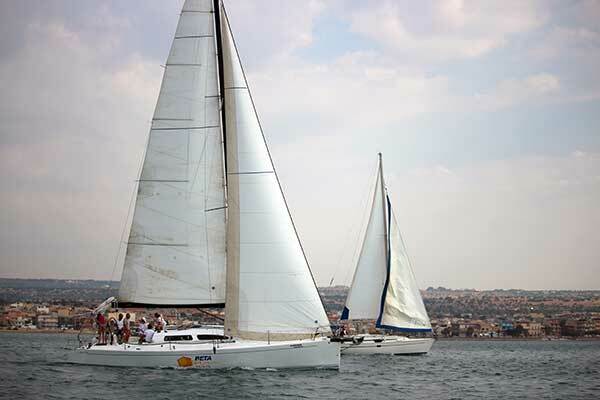 On Sunday morning the Maltese yachts will be joined by other boats from the Lega Navale Sezione di Pozzallo for a ‘Sail along the Pozzallo coast’. This ‘Sail along the Pozzallo coast’ will see each boat hosting two young school children who most probably will be enjoying their first taste of sailing. The ‘cadets’, all proudly wearing caps and t-shirts of the Lega Navale Italiana, are students who attend the Istituto di Istruzione Superiore "Giorgio La Pira" - Pozzallo. Such initiative will not only prove exciting to the new young sailors but also to members of their families and friends who will be following this sail from the shore. Another pleasant activity planned for the Maltese sailing community will be a visit to the Feudo Ramaddini winery in Marzamemi on Monday for a Wine Tasting presentation over a selection of Sicilian delicacies. The winning trophy on the four-day Cruise to Pozzallo is an enjoyable all-family relaxing sailing break.